Researchers have added 15% to the lifespan of laboratory mice by deleting the second copy of a tumor-promoting gene known as MYC. In human equivalent terms if that could be done in humans it would add about 12 more healthy years to the lifespan of Homo sapiens. The problem is we can’t remove a copy of the MYC gene from every cell in the human body. But we can inhibit the activation (gene protein-making) of the MYC gene and possibly achieve the 12 extra years of life like the lab mice did. Such a powerful effect from just one gene is a headline news story today. 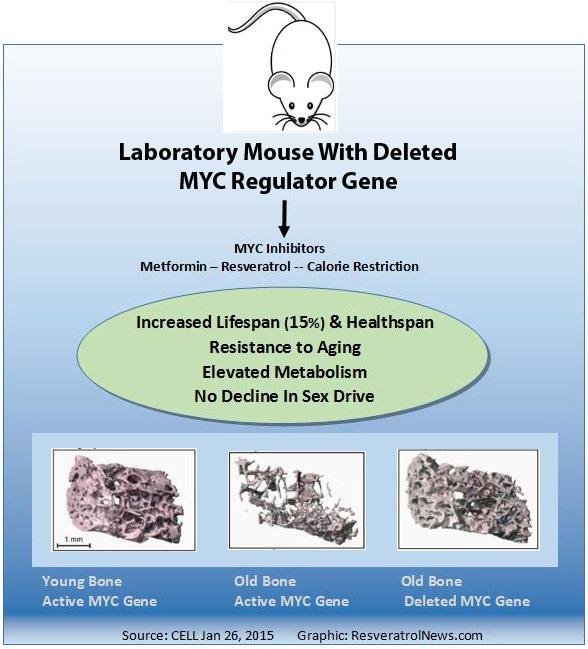 Inhibition of MYC increased male lifespan by 10% and female lifespan by 20% (15% average). As background information, the size of the human and mouse genome (library of genes) is about the same – 25,000. The mouse and human genomes are homologous, that is, presented in a similar order. Networks of genes are switched on or off (expressed or silenced) as aging progresses. So the biological impact of deletion of a second copy of just one gene is quite remarkable. Even more extraordinary is these MYC-inhibited mice were far healthier. The bones were not withering with advancing years. Striking graphic images of this effect are reproduced (above) in this report. All of the organs and tissues in these mice aged slower. These MYC-inhibited mice were smaller but otherwise suffered no other untoward consequences, exhibiting strong mating activity in old age! (Here, here!) This is in contrast to calorie-restricted diets whose anti-aging effects are offset by reduced ability to reproduce. However, the crossover of common genes activated by the anti-diabetic drug metformin, and the red wine molecule resveratrol and a calorie-restricted diet, all known as anti-aging strategies, was not remarkably similar to that of the mice with the deleted MYC gene. 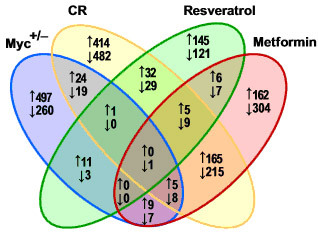 Cross-over of genes activated or inhibited by various anti-aging agents (metformin anti-diabetic drug, a calorie-restricted diet or the red wine molecule resveratrol) compared with laboratory mice with a deleted MYC gene. It is interesting to learn what overactivates this gene – metallic minerals such as iron and copper that tend to accumulate in living tissues with advancing age.